Fastpath:Click the Views icon ( ) in the sidebar. As an agent, your primary responsibility is to solve your customers' support requests. To do that, you work with tickets, which can arrive in various ways such as via the Help Center request form, directly through email, by telephone and text chat, and from social media such as Twitter and Facebook. The options your customers have for requesting support are called channels. Your account owner or the administrator who set up your Zendesk Support determines what channels are included. 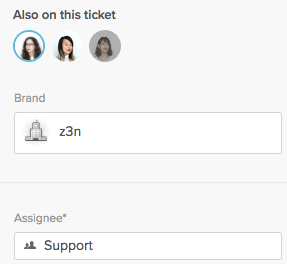 Depending on how you manage your ticket workflow, you may manually select and assign tickets to yourself or other agents. 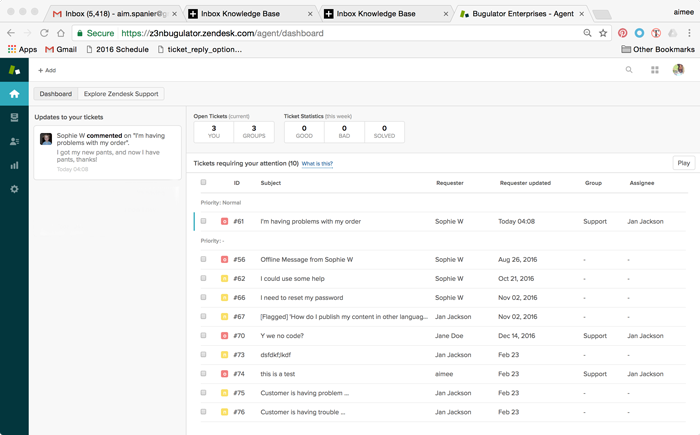 Tickets can also be automatically assigned to you and other agents via automations and triggers, which are referred to as business rules (you can read about these workflow management tools in Streamlining your support workflow in the Administrator Guide). Tip: If you want to learn more about the agent interface and agent workflows, check out the Zendesk Support for Agents training course. The agent home dashboard displays information about tickets assigned to you and your groups, including open tickets and ticket satisfaction statistics. You can view the agent home dashboard by clicking the Home icon ( ) in the sidebar. 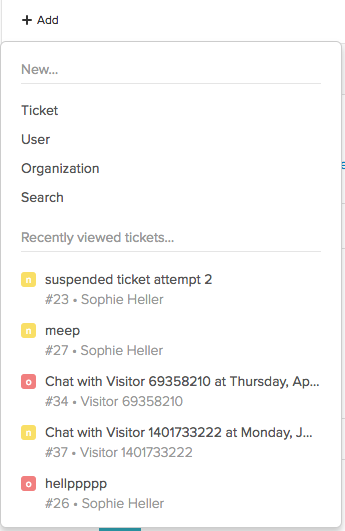 In the main window of the dashboard is a view of tickets requiring your attention. Have the status New or Open. Are assigned to you, unassigned in one of your groups, or not assigned at all. Are grouped by Priority, and by the latest Requester Updated date (oldest first). If the requester updates the ticket in any way, it is moved to the bottom of the list. You can click on any of the columns (ID, Subject, Requester, and the like) to sort Ascending or Descending. However you cannot customize the dashboard view. Tickets are organized into views, groups of tickets based on certain criteria. You can preview or open tickets from your view. Depending on your permissions, you may see the Deleted tickets view. For more information, see Viewing deleted tickets. Note: Depending on your settings, you might only be able to perform these actions on your default Your assigned tickets view. For details, see Using the Play button. Locate the ticket in the view list. The ticket opens in the main window. Click the Views icon ( ) in the sidebar. From a ticket, click the Next ticket arrow in the upper-right corner of the ticket. The next ticket in the current view opens, even if another agent is currently viewing it. If another agent is viewing the ticket, you will see the agent collision notification. Note: If you click the Next ticket arrow after clicking Play, the Next ticket arrow serves the next ticket that is not being viewed by another agent. See Using Play mode for more information. 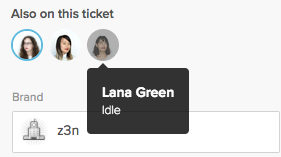 From a ticket, click the menu to the left of the Submit button, then select Next ticket in view. You do not have to select this option each time you submit a ticket. 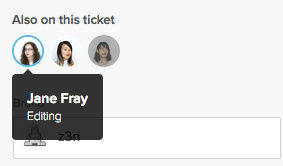 Once selected, the next ticket in the view will always open when you submit a ticket update. You can chose Close Tab if you prefer to open the current view after you submit a ticket. You can expand and collapse your list of views by clicking the arrow at the top of the views list. When collapsed, the views list will auto-show when you mouse over it, and auto-hide when you mouse away from it. When the arrow is pointing towards your Views, the list is locked. When the arrow is pointing towards your tickets, the views list will auto-show and auto-hide. By default, your views lists are expanded. Click the arrow at the top of the views list. Your list of views collapses. Mouse over the collapsed views list to auto-show the list. Click the arrow at the top of the views list to lock it in place. The views list is locked in the expanded position. You can see the last five tickets that you viewed by hovering over the +add tab in the top toolbar. Note: The recently viewed tickets list disappears after 72 hours if there is no action taken on any of your tickets (including viewing and updating tickets). On Professional and Enterprise, you can tell if another agent is working on a ticket from views or directly in the ticket. This makes it easier to avoid potentially conflicting updates to tickets. Agents with regular pictures are viewing the ticket but not actively editing any fields. Agents with dimmed pictures have the ticket open, but have navigated away from it. You'll also see the agent collision message in the ticket summary pop-up that is displayed when you hover over a ticket in a view with your mouse. The Play button guides you through the available tickets in a view automatically. Press the Play button or icon to open the first ticket in the view. After addressing the ticket, click Submit to update it and automatically move to the next available ticket. 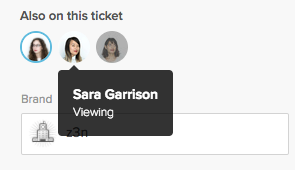 The next available ticket is the next ticket in the view according to the view's sort order (see Using views to manage ticket workflow) that you haven't already skipped and that no other agent is currently viewing. Views are also refreshed every five minutes, so you might see a ticket that wasn't part of the view when you started Play mode. Enterprise customers have an additional option, Guided mode, which automatically launches Play mode when an agent opens a view. If your administrator has enabled Guided mode, some of the procedures described in this section may not apply. For details, see Setting up Guided mode (Enterprise). Note: The Play button is not available for Essential plans. Click the Views icon ( ) in the sidebar and select a view. Click the Play button in the upper right hand to open the first ticket. Depending on your settings, you might be able to skip this step. The first available ticket in the view opens. Click Submit. The next available ticket opens automatically. By default, the next available ticket opens when you click Submit. To stay on the ticket after submitting changes, click the menu from the left of the Submit button and select Stay on ticket. Change this option back to Next available ticket before submitting your final updates so you can move to the next available ticket. 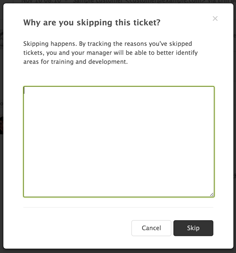 Click Skip to move to the next ticket without making any changes to the current one. If you are in Guided mode and your administrator has configured your role, you might also be required to enter a reason for skipping the ticket. Enter a reason in the window that appears and click Skip again. Rich content option was way overdue! Bye bye Markdown! Thanks Zendesk. Are there plans to add some sort of agent collision feature to the mobile app? Maybe it is there and I missed it but I do not believe I can tell when other agents are working on a ticket from the Android mobile app. We've found that when an agent manually sorts a column in a view, play mode will then function in that order. Is there a way to make sure Play mode only works in the default sort order of the view? Is there a way to display the amount of tickets left in the PLAY queue when working in Play mode? I wish I had better news however this is not something that is possible at this time when using guided mode. I am not exactly sure why this is the case from a technical standpoint, however I could foresee some limitations in that Support does not auto refresh and a live ticket counter of remaining ticket would require some type of live refresh functionality to function effectively. However I will make this as a feature request for our Product team to track. Just want to chime in here because I'm getting a lot of concern around play mode from my org. We have 3 levels of priority for our inbound tickets from API/Contact us: Urgent, High, Low. My expectation is that urgent tickets get served first always, then high then normal. If only normals are in the view and one urgent pops up that urgent then gets served. From what I see in the comments this should be true - unless the agent manually sorts the view for some reason. Also, how does the 5 minute view refresh impact play mode? If I am an agent working tickets and there are 5 normal tickets one minute and 5 urgent tickets the next I expect my agent will be served the urgent. But should I expect a lag here? Thank you for contacting us with your views question. Regarding your questions, yes! You are right, If your views are sorted by priority as you described, then the order of served tickets will be Urgent > High > Normal. As for the lag, the way the refresh works in play mode the view is updated every 5 minutes. Now, if a ticket is created at minute 1 of these 5 minutes, it will not appear to your agent in the play mode and would assign an existing ticket to him till these initial 5 minutes are over. Then, once he updates that ticket 5 minutes after he got it he will get the urgent ticket. An important thing to notice, is that this 5 minutes refresh in play mode, is per agent, not per view. So if you have multiple agents working on tickets in this view, they could as well grab it as soon as it is in the view. I hope this helps you understand your ticket workflow by using the play button. If you have any other question, feel free to contact us. One of my colleagues saw this same issue today. She cleared her browser cache and cookies, and the problem resolved itself. If your agent is still seeing this after clearing cache and cookies send a ticket to Support so we can take a closer look! For play-mode you wrote: Depending on your administrator-configured settings, you might also be required to enter a reason for skipping the ticket. Enter a reason in the window that appears and click Skip again. There are no option to require reason or not. If it's exist can you tell me where? I believe the wording is a little off here. There is no option to require play only agents to enter a skip reason. They are asked for a reason, but entering a comment is not mandatory. In the Agent's profile under the 'Play Only' tab, you can view the instances where they have skipped tickets and not entered a reason. It'd be nice to see greater consistency here: Strange and awkward not being able to jump into Play Mode or use "Next available" when working a one-off. Is there a way to delete an update to a ticket? For instance, if you put an update into the wrong ticket or incorrect information in a ticket. The ticket comments are considered a System of Record, and for that reason, comments cannot be deleted or edited. There is, however, a redaction app, which you can use to block out irrelevant or sensitive information in a comment. Is it posible, when we are in a ticket or using play mode, to know how many tickets left we have in this view? Play mode is great for helping agents get through tickets, but it does not offer the ability to see what's left in the view. Hi! If one of our customers has several open/pending tickets at a time, is there a place where they can check that somehow? Or is that tracked only through email? @Mindaugas, thanks for the reply! Where can we edit the settings to allow our end users to sign in? This play feature is neat, I really wish our admins (Becky and Alex) would have communicated this sooner. It's not something you can customize at this time, Zachary, but that is a neat idea! How long until an agent is set to "idle"? Inactivity will not trigger an idle status only navigating away from a ticket. Navigating away from a ticket can include actions such as viewing a different tab or navigating to the view page. If the agent is on the ticket but not doing anything they will simply have a "Viewing" status attributed to them. Hello! I really like the Play feature but it pulls from the most recently received ticket rather than the oldest. It doesn't make sense to respond to the newest tickets first when older support requests are waiting - can this be adjusted? The Play feature will adhere to whatever the sort order in the view is. All you need to do is reverse the sort order so you're starting with the oldest ticket in your view.